Why Use Databases Instead of Google for Your Research? Free Test Prep with a Library Card! The aquarium offers story times and diverse shows as well as other educational programs. Octopuses from the wild will be released in three months or so. You may not see Vincent but I am sure his replacement will be there to greet you. Octopus feeding is a popular show. (It is an attempt to feed them since they are the ones that decide to eat or not.) There is always much more to see and learn at Seattle Aquarium. Before or after your visit, read all about sea creatures that think and use tools to survive. Guide to evolution, consciousness, and marine biology by a philosopher. The smallest marine mammals skillfully use tools to survive, and they even play with toys. A helpful glossary and references are included in this book about Sea Otters. 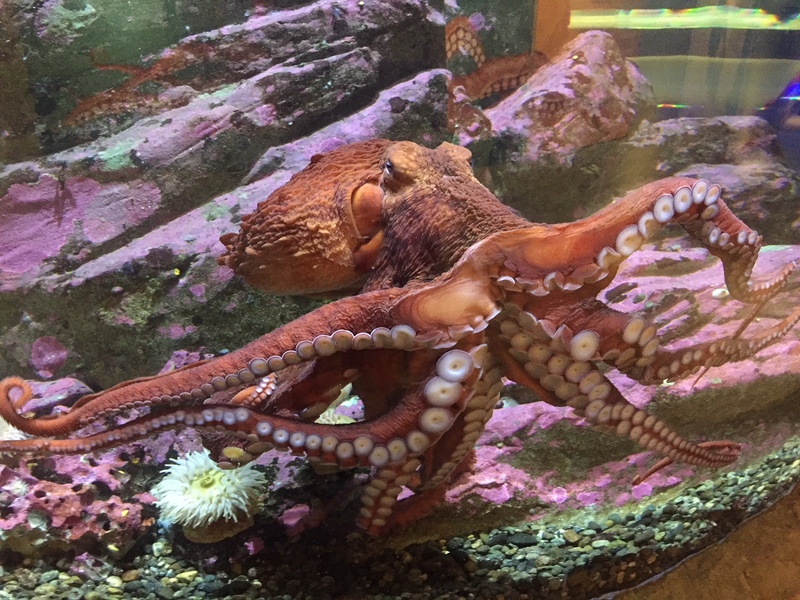 Inky, the octopus escapes from an aquarium tank! But how? With colorful artwork, the author tells us how curious and smart octopuses are. The scientist and the photographer team dove into the seas and identified the personalities of these mollusks. With many colorful underwater pictures (and some above the sea), the chapters describe different aspects of the world of octopuses. DVDs and streaming videos on Marine Animals (nonfiction) at KCLS will invite you to explore the world of marine animals. This list on the topic of ocean life includes movies (streaming and DVDs), books, and eBooks to explore as you think about humans and creatures in the ocean. Marine animal books (in print and online, nonfiction available at KCLS) includes over 300 items. Filter the list using the left side menu by your branch name, audience, format, etc. to find what you want. Below is a 6-second video of Vincent walking in the tank. Enjoy his graceful movement!